WITH A RECURRING DISCOUNT UP TO 45% WITHOUT SWITCHING COMPANIES! The new law, Florida Law Statue 626.0629, requires insurance companies to offer Florida homeowners' discounts or credits for construction that reduces damage and loss in windstorms. The windstorm mitigation inspection covers several different construction features that can qualify you for major discounts on the windstorm portion of your homeowners insurance. Even if you have already paid your premium you may be eligible to receive money back. Almost every home qualifies for some type of discount and some for a substantial discount. Let us help you to save money! The State of Florida requires insurance companies to offer a reduction in rates for certain windstorm resistant features in order to discount your windstorm insurance. It is the intent of the Legislature for insurers to provide savings to consumers who install or implement windstorm damage mitigation techniques, alterations or solutions to their properties to prevent windstorm losses. The discounts apply to both newly built homes after March 1,2002 built to the Statewide Florida Building Code and homes that were built after 1994 to the South Florida Building Code in Miami-Dade and Broward Counties. 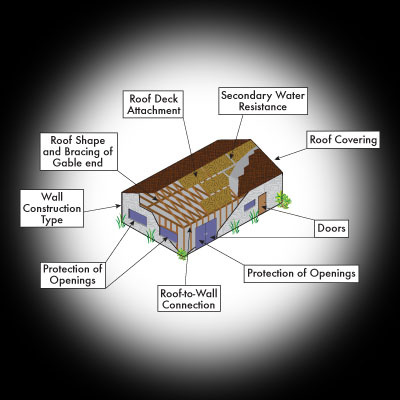 We will document and verify the hurricane mitigation features on your home. The savings can be substantial and are recurring each year. To qualify for these discounts most insurance companies require a certification of the key construction features which can be verified and documented in approximately 30 minutes. (installed with proper nails and spacing- you can receive up to a 5% discount). (i.e. shingles that meet the Florida Building Code Requirements). (clips, single or double wraps, toe nails/screws, structurally connected -you can save up to a 18% discount).